A one-pan dish that can be enjoyed at breakfast, lunch or dinner. Lightly dressed salad leaves are all that is needed alongside. 1. Preheat the oven to 200 ̊C, gas mark 6. Toss the sweet potato with the oil and scatter in a large, ovenproof frying pan; season. Roast for 40-45 minutes, until tender and browned at the edges. 2. Using an oven glove, carefully remove the pan from the oven. Turn the grill to high (about 250 ̊C). 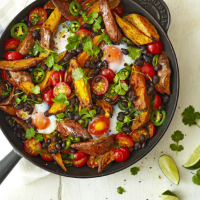 Toss the black beans, tomatoes, chilli, coriander stalks and most of the leaves into the sweet potato; season. 3. Make 4 wells in the mixture and crack in the eggs; grill for 5-8 minutes, until the eggs are cooked to your liking. Scatter over the lime zest and juice, and the remaining coriander leaves. Serve with the remaining lime, cut into wedges, for squeezing over.